35th President of the United States (1917-1963). 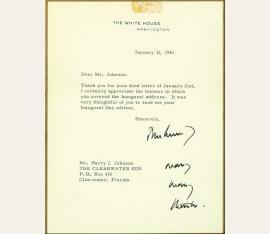 Letter signed ("John Kennedy"). Washington, DC. 4to. 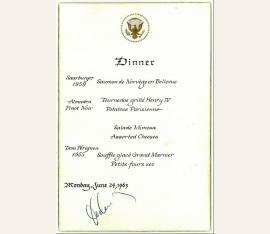 1 p. White House stationery. 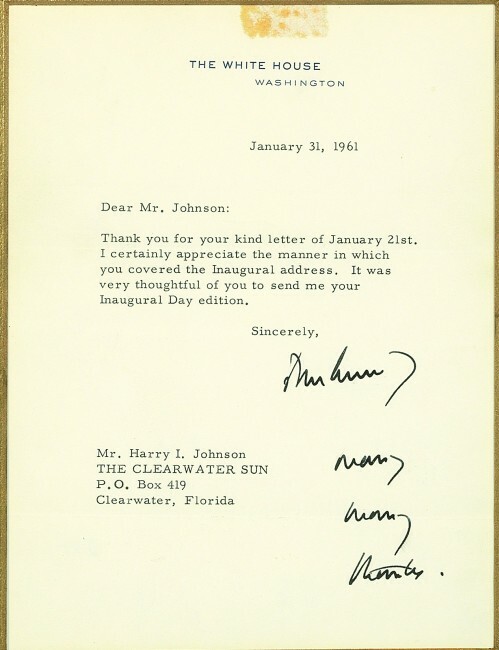 As President, to Harry I. Johnson of the Clearwater Sun, thanking him for his coverage of the Inaugural address, with a holograph postscript: "Many / many / thanks": "I certainly appreciate the manner in which you covered the Inaugural address. It was very thoughtful of you to send me your Inaugural Day edition". - Stains at all edges from prior mounting, horizontal fold. US-Präsident (1917-1963). Gedr. Menükarte mit eigenh. U. sowie vier weiteren Unterschriften. [Bonn]. 2 SS. 8vo. 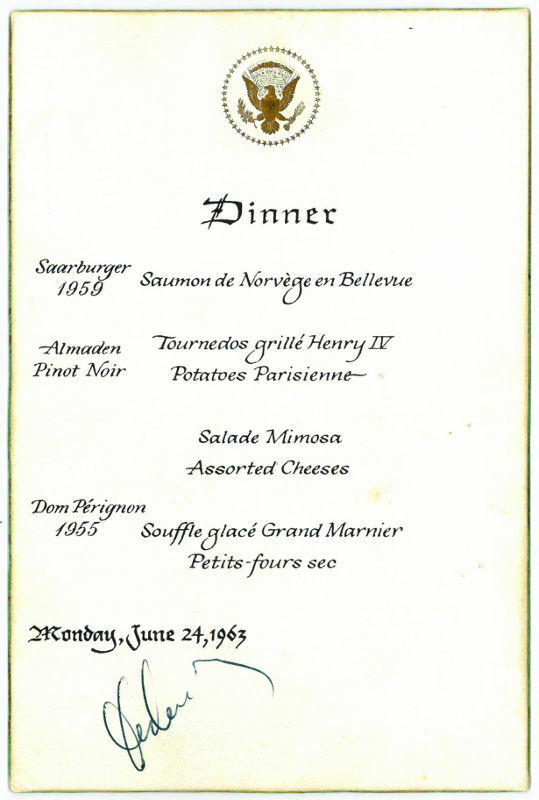 Menükarte eines Dinners zu Ehren des amerikanischen Präsidenten Kennedy, der im Rahmen seiner Europareise 1963 von 23. bis 26. Juni in der Bundesrepublik Station machte. Zwei Tage darauf hielt Kennedy seine berühmte Rede vor dem Rathaus Schöneberg in West-Berlin. Mitunterzeichnet ist die Karte von Bundeskanzler Konrad Adenauer, Vizekanzler Ludwig Erhard (der im Oktober des Jahres Adenauer im Amt nachfolgen sollte), Franz Josef Strauß und dem amerikanischen Außenminister Dean Rusk. John F. Kennedy (1917-1963), US-President. 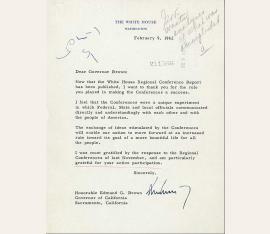 Typed Letter Signed as President, on green White House letterhead, Washington, February 9, 1962. “...I want to thank you for the role you played in making the Conferences a success. I feel the Conferences were a unique experiment in which Federal, State and local officials communicated directly and understandingly with each other and with the people of America. The exchange of ideas stimulated by the Conferences will enable our nation to move forward at an increased rate toward its goal of a more bountiful life for all the people. I was most gratified by the response to the Regional Conferences...” – Kennedy sought to improve the lives of the American people, and he articulated the issues to be tackled. “We have a steadily rising population. We have the problem of maintaining high employment. We want education for our children. We want our families to live in decent housing. We want to keep our employment steadily growing, and to take advantage of the millions of young men and women who are coming into the labor market everywhere. 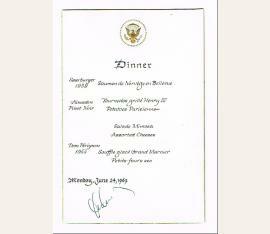 And we want to provide security for our older citizens.” In November 1961, he called a set of innovative White House Regional Conferences, both to obtain ideas on measures and methods to attain these goals, and to ensure that the government in Washington remained close to the people at home. Representatives of various Federal agencies and departments traveled to major cities to talk to informed and interested citizens about the difficulties they faced, and what government might do help solve their problems. Governor Brown played an active role in the San Francisco and Los Angeles conferences. Gedr. Menükarte mit eigenh. U. sowie vier weiteren Unterschriften.